President Muhammadu Buhari has felicitated Vice-President Yemi Osinbajo and nine others for surviving an helicopter crash on Saturday in Kabba, Kogi State. The President’s message was contained in a tweet posted by his Senior Special Assistant on Media and Publicity, Garba Shehu, in Abuja on Sunday. The News Agency of Nigeria reports that the vice-president and nine others had, on Saturday, escaped unhurt when a hired helicopter conveying them to Kabba, Kogi State, crash-landed. The vice-president has been receiving solidarity messages from within and outside the country since the incident occurred. 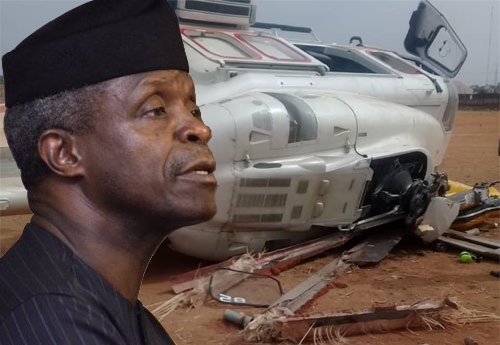 Osinbajo was quoted to have said that no amount of thanksgiving and praises to God would be enough for saving his life and those of nine others in Saturday’s helicopter crash. He spoke during a Thanksgiving service at the Redeemed Christian Church of God, City of Grace, Lokoja. The General Manager, Public Relations, Nigerian Civil Aviation Authority, Mr. Sam Adurogboye, on Sunday said the authority has commenced investigation into the incident. Adurogboye, who confirmed this development to NAN, said the investigation was being conducted by the Accident Investigations Bureau.